A mindless action thriller, London Has Fallen is a disappointing sequel, going far beyond suspension of disbelief and into ridiculous territory. American intelligence services destroy the desert hideout of international arms dealer Aamir Barkawi (Alon Moni Aboutboul) with a drone strike. Two years later the British Prime Minister dies suddenly. All the world's leader make plans to attend the funeral in London, including US President Ben Asher (Aaron Eckhart). His Secret Service Director Lynne Jacobs (Angela Bassett) is nervous about the lack of security planning time, and agent Mike Banning (Gerard Butler) is entrusted with keeping the President safe. With his wife Leah (Radha Mitchell) pregnant, Banning is contemplating resigning from active duty but accepts the London assignment. Just before the funeral is set to start at St. Paul's Cathedral, a large number of heavily armed terrorists disguised as police officers launch coordinated attacks throughout London, causing mass casualties. Banning is barely able to extract Asher from the main attack zone, and the two go on the run. The attack is funded by Barkawi, seeking revenge for the death of his family members. With London swarming with terrorists, Banning has to keep the President alive long enough for friendly backup forces to arrive. 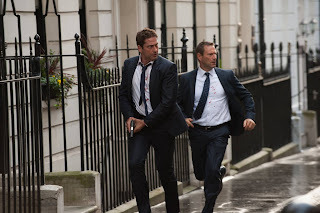 While 2013's Olympus Has Fallen was a laudable riff on Die Hard, London Has Fallen chucks out all that was good about the original, and leaves only brain dead action behind. After just 15 minutes of rudimentary set-up, director Babak Najafi unleashes the noise and fury of a London overrun by terrorists, and the film does not take a breath for the remainder of its 99 minutes. There is a fine line between a far-fetched premise and just a lazy idea. Olympus was a far-fetched premise very well executed. London lands with a thud on the wrong side of that boundary. 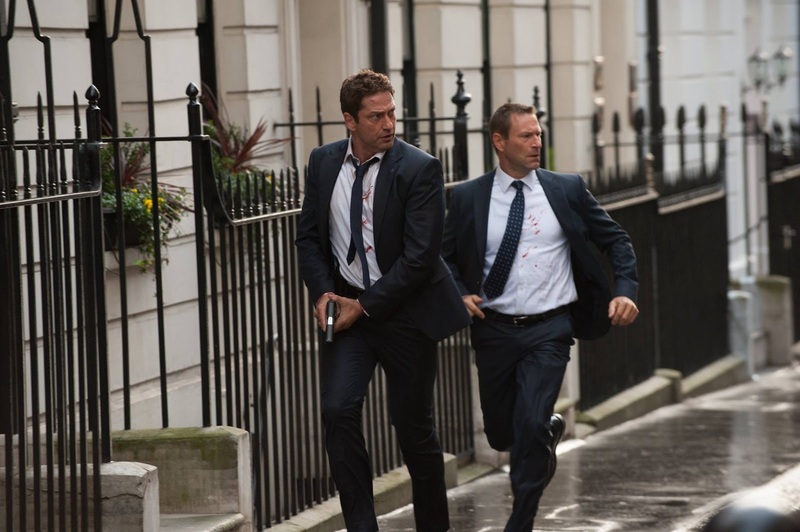 The script requires a massive number of police officers -- even Buckingham Palace guards! -- to be secretly replaced with an army of bad guys armed to the teeth with machine guns and grenades in the run up to London's biggest ever security operation, without anyone noticing. And after the initial attack things get worse, with hordes of terrorists on motorcycles, in cars and with stinger missiles having free run of the city, and no genuine enforcement types of any stripe even attempting any sort of intervention. Of course the same terrorist leaders who carefully planned this secret but massive operation consisting of thousands of undetected attackers will now be stupid enough to be defeated by a single secret service agent. Despite all its faults and some cheap special effects, London Has Fallen occasionally captures the freewheeling spirit of a third-person shooter console game, Najafi at least staging his numerous action scenes with some panache. And in Gerard Butler he has an actor willing to grit his teeth and get on with all the killing necessary to save his President, while almost giving the impression that he is taking it all seriously. In addition to Eckhart and Basset, the supporting cast also includes Morgan Freeman in another throwaway performance as the Vice President, while Melissa Leo and Robert Forster are utterly wasted in tiny roles. London may have fallen, but the quality of this franchise fell faster and deeper.